This music tech news roundup features the latest music industry announcements and emerging technologies. Renowned electronic instrument designer Roger Linn has released a smaller, more affordable version of his versatile LinnStrument MIDI controller designed to give electronic musicians more expressive control over hardware and software synths. The more compact LinnStrument 128 features a grid of touch sensitive pads capable of sensing five different parameters to control note characteristics: strike velocity, pressure, left-right motion, front-back motion, and release velocity. The LinnStrument 128 sports a powerful 2-track step sequencer, an expressive swing arpeggiator, a split keyboard to play two separate sounds, foot switch options, open-source software, and more. Elektron releases Analog Heat, a hardware effects processor that features eight different analog stereo distortion circuits, stereo analog multi-mode filter with seven filter types, two-band stereo analog EQ, assignable envelopes, and an assignable LFO. Analog Heat is also Overbridge enabled and can be fully integrated with your DAW. In addition, Analog Heat can function as a 2 in/2 out sound card, even while processing DAW audio. UVI releases Synth Anthology 2, a massive collection of 77 hardware synthesizer multisampled sounds that have been expertly programmed, individually sculpted with outboard processors, and mastered to perfection. Synth Anthology 2 delivers the renowned sounds from major manufacturers spanning over several eras that include Roland, Yamaha, Oberheim, Sequential Circuits, PPG, Korg, Casio, Moog, ARP, Waldorf, NED, Access, Kawai and more. Each hand-crafted sound has been brought to life using hardware processors including EQs, compressors, and effects from Manley, Langevin, Lexicon, Publison, Focusrite, SPL and more. In addition, Synth Anthology 2 provides deep sound editing capabilities in a clear and easy-to-use interface that allow users to quickly browse, tweak, edit, effect, modulate, and layer sounds from any synth with ease. Instrument designer Joué has introduced an innovative and evolving MIDI instrument that offers artists a unique level of expressivity and spontaneity. The Joué features a modular design, which allows you to customize a variety of controls on its playing surface. Joué is made of wood and is equipped with a pressure sensitive sensor where you place touch sensitive magic modules such as piano keys, guitar strings, drums pads or 3D control surfaces that offer an infinite playground for musicians. Joué’s high sensitivity sensors and unique texture allow natural gestures such as vibrato, bending, finger drumming, and high-velocity giving you expressive control over any instrument. Famed audio accessories company MasterSounds has partnered with Union Audio who engineered Richie Hawtin’s recently launched PLAYdifferently MODEL 1 mixer to create Radius 2, a hand built two channel analog rotary DJ mixer. The mixer offers fantastic, open and dynamic sound on both LINE and RIAA inputs, as well as great usability. 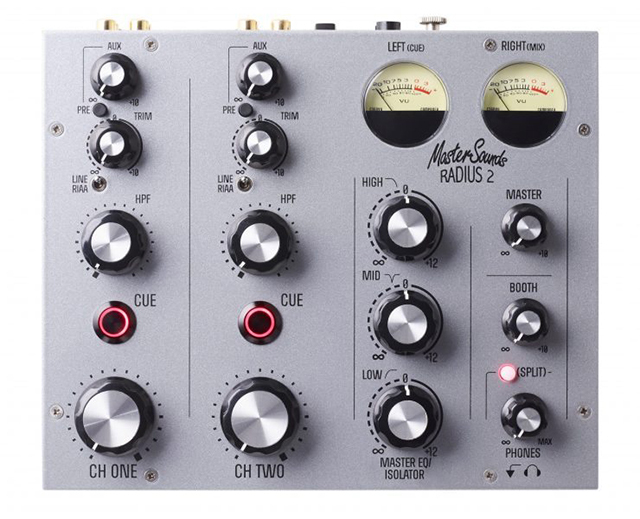 Radius 2 also features easy-reading VU meters, a responsive Master EQ/Isolator, a smooth, natural sounding hi-pass filter on each channel and an AUX Send/Return system for easy integration of external effects. 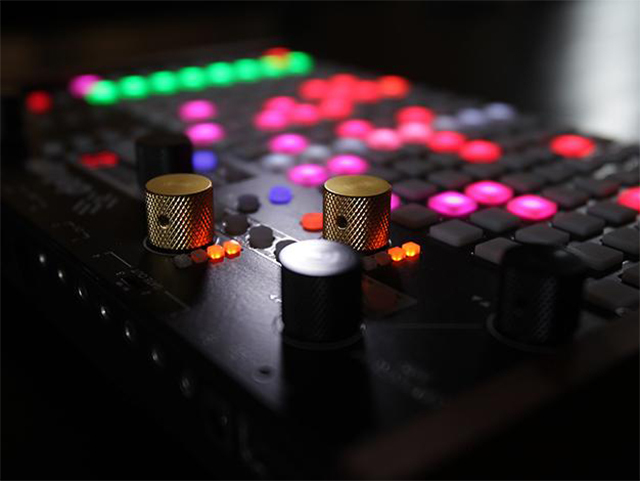 Synthstrom Audible releases Deluge, an all-in-one, stand-alone, portable synthesizer, sequencer, and sampler designed for the creation, performance and improvisation of electronic music. Deluge offers piano-roll-style sequencing on 128 full RGB pads with scrolling and zooming, a full-featured subtractive and FM synthesis engine, customizable patching matrix, a variety of effects and modulation options, time-stretching of samples, various scale modes, internal speakers and mic, SD-card storage, and a host of other features. Apple launches the completely redesigned MacBook Pro that is faster, more powerful, thinner, and lighter. It has the brightest, most colorful Mac notebook display yet and introduces the Touch Bar, a Multi-Touch enabled strip of glass built into the keyboard that replaces the function keys for instant access to various tools. This latest model also scrapes traditional USB ports and introduces Thunderbolt 3 which integrates data transfer, charging, and video output in a single connector, delivering up to 40 Gbps of throughput. Other upgrades include redesigned system powered that provide twice the dynamic range, 58 percent more volume, two and a half times louder bass, and three times more peak power. All three models feature SSDs with sequential read speeds over 3GBp among several other improvements and features. Ableton introduces Ableton Live Set Export, a new software development kit for iOS designed to make it easy for developers to add ‘Export to Live’ functionality into music apps. The library allows an application to write all types of Ableton Live project files. Live Set Export addresses a growing need for musicians using iOS music apps, who would like to move their musical ideas to Ableton Live.